The restaurant Hotel de Ville of Vaulruz is a small family restaurant that proposes some fine cuisine in a very relaxed atmosphere. The menu offers a variety of plates from the simple fondue to more elaborate suggestions like a deer filet mignon or tuna tataki. At lunchtime, two nice prix fixe menus are proposed for less than 20 francs. In the evening, the tasting menu price is between 60 and 90 Swiss Francs. The wine list offers many choices mainly with Swiss and French wineries, from the nearby vineyards of Lavaux to to famous names from Burgundy. 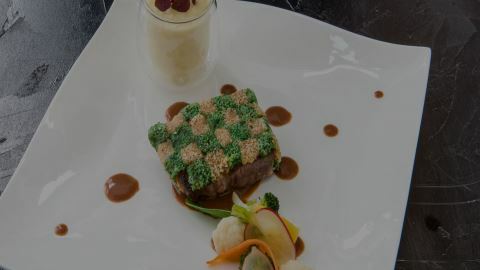 The restaurant Hotel de Ville of Vaulruz is mentioned in both the Michelin and the Gault&Millau gastronomic guides. If the village of Vaulruz has its own highway exit, you can also easily get to this restaurant if you travel with public transportation, as the restaurant is located just in front of the Vaulruz-Nord station on the Bulle-Fribourg CFF train line. We found this lovely place from a advice of the Ibis hotel in Bulle. This is a really nice restaurant just a few minutes away from Bulle using the highway. Delicious food and warm service. Nice wine list also for the amateur. HIghly recommended as our best dinner in Gruyere! Hotel de Ville de Vaulruz is a wonderful restaurant in the countryside, five minutes from Bulle. Exellencent cuisine French cuisine with a local and original twist.